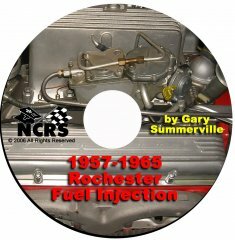 Gary Summerville has condensed his highly informative 1957-1965 Rochester Fuel Injection Seminar into a handy CD format. Its a large Power Point presentation filled with information that you can use to rebuild your Fuel Injection unit. This is the same presentation that Gary has done at NCRS National Conventions and Regional Meets. The CD was designed to share and illustrate information about the Rochester Fuel Injection system in order to help you identify defective parts, breakdown/sequence individual components, and both properly disassemble AND reassemble the Fuel Injection units. It will give you a better understanding and confidence to rebuild your FI unit. The CD will work with any PC running Windows 98 (and later) operating system. It is NOT necessary for Power Point to be installed on the computer.